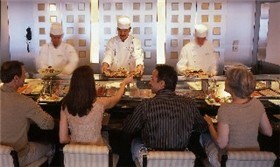 A luxury cruise delivers high-end service and amenities. But if you've got the money and the time, Crystal, Regent, Seabourn and Silversea have some highly customized options for upscale cruisers. You might hire a Personal Shopper in St. Thomas, enjoy a private dinner with another couple, or ask the line's concierge to plan a personalized adventure. C'est si bon! In our "Lap of Luxury" column, Editor Susan J. 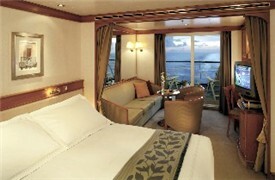 Young outlines what's guests may expect if they sail in a Royal Suite on Silversea Cruises. Young sailed on that luxury line's Silver Shadow in December 2007. In this column, she gives her impressions of the suite, its amenities and the service staff. What's the experience like? What can you expect? Come along for the royal treatment at sea. In our Lap of Luxury column this month, Gregory McCluney, a wine and culinary enthusiast and freelance travel writer, is our guest author. Today's luxury lines offer wine tastings and cooking classes, private dinners on your balcony, shore excursions to markets and farms, and winery and spirits visits. 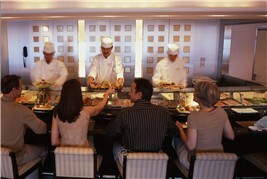 Crystal's sushi bar, for example, is shown at left. Let's sail along. 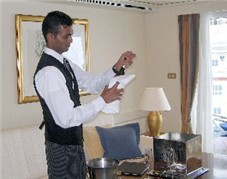 When it comes to service, Seabourn shines. That's the view of Editor Susan J. Young, who sailed recently on the line and offers her personal gleanings. 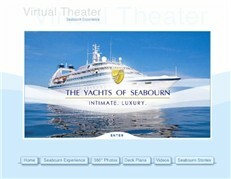 Several Seabourn voyages sail from or visit ports in the U.S. South. One Colonial Harvest voyage sails on Oct. 18 from Gloucester, MA, and visits such cities as Charleston, SC and Savannah, GA. Several 2007 holiday cruises and a few 2008 Caribbean voyages depart from Port Everglades. A luxury cruise is a sizable vacation investment. If you've never taken a cruise on Crystal, Cunard, Regent Seven Seas, Seabourn or Silversea, how will you learn about the experience? In this Lap of Luxury column, we showcase the diverse virtual and visual experiences offered online. Go "Shopping with the Chef," enjoy Web cam views, view photo albums or create your own movie. Regent Seven Seas has changed its smoking policy, banning smoking in all guest suites and on guest balconies while still retaining several designated smoking areas on each ship. In our first "Lap of Luxury" monthly column, Editor Susan J. Young interviews Mark Conroy, Regent Seven Seas' president and CEO, about the changes. She outlines Regent's policy as well as policies of other luxury cruise lines. So come along. See if you agree with the policies.